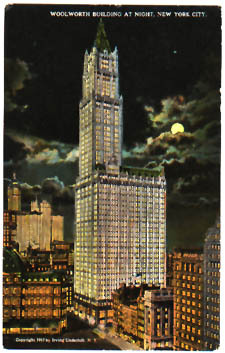 The Woolworth Building is unusual among skyscrapers for having been financed in cash. Its owner was five and dime king, Frank W. Woolworth, who in 1910 commissioned architect Cass Gilbert to design a Gothic-style skyscraper to soar above City Hall Park on a full-block site on Broadway between Park Place and Barclay Street. The height and cost escalated from an estimated 625 feet and $5 million to the final of 792 feet for $13.5 million. The extensive foundations and wind-bracing necessary for a tall and slender tower and the elaborate terra-cotta exterior and sumptuous lobby desired by Woolworth helped to inflate the costs. Until recently, however, the building never had a mortgage--an unusual circumstance for any large commercial structure. When the Venator Group (formerly the Woolworth Corporation) announced on June 23, 1998 that it would sell the tower to the Witkoff Group for $155 million, the building changed hands for the first time in its 85 year history. Praised in 1913 for its "success of scale," the building remains a much admired structure. The cruciform plan of the ornate lobby evokes religious architecture; an extensive sculptural program graces the yellow marble interior, including medieval-style caricatures of Mr. Woolworth counting his dimes and of Gilbert cradling a model of the building. Gold tesserae and allegorical murals of Commerce and Labor cover the vaulted ceiling. The opening ceremonies on April 24, 1913 were as fantastic as the structure itself. President Wilson pressed a button in the White House that night and simultaneously lit up every interior floor and the exterior floodlights which illuminated the facade. It was during this same opening celebration that the Reverend S. Parkes Cadman provided the Woolworth Building with the epithet the "Cathedral of Commerce."